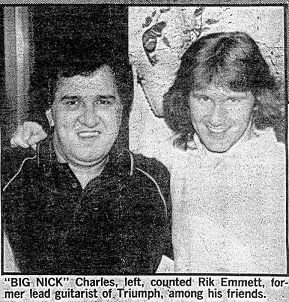 Family and friends at a Toronto memorial service for "Big Nick" Charles last night remained mystified over how the popular deejay died. A huge, gentle man only 35 years of age, Charles was for 10 years a fill-in disc jockey at CFNY-FM until he lost the job in staff cutbacks in 1986. In the 1970's, aided by his imposing size, he drove for Toronto Limousine whenever rock stars came to town. The Stones, Rod Stewart, Elton John, Billy Joel, Bette Midler, the Bee Gees and Rick Springfield all knew the 6-foot-3, 280-pound driver who "parted the crowds like Moses with the Red Sea," said his friend Terrance Young. Big Brothers organizers knew him for the time and energy he donated as master of ceremonies. Authorities found Charles' body Jan. 3 in his Rexdale apartment. An autopsy failed to reveal how he died, and the body is now in a two-month queue for toxicology tests at the forensic lab. "He had more than one secret," said Young. Charles lived with his divorced father for years after high school "and we all thought it was his uncle." Last September, Charles' father died. Jobless, and apparently penniless, Charles drifted back to spend a joyous Christmas with his mother and two sisters. "It's a mystery - why did he appear, and then all of a sudden he's taken away?" said his sister, Leila Ruhe, 44. "It's a real puzzle," said Jeanette, wife of Rik Emmett, until recently the lead guitarist with the Triumph rock group. "Something strange - maybe some kind of foul play." Nick Charles or 'Uncle Nicky' is my uncle. I remember him coming and going from our lives but he was always a happy, spirited man. He used to hang out with his nieces and nephews in 'Weston' and make rootbeer floats. When he was a limo driver he got me a huge, glossy, signed photograph of The Bay City Rollers when they played the CNE. He was their limo driver when they played T.O. I always thought he lived this exciting life. By the time he was working at CFNY we barely saw him....we think about him a lot.